FM&P is essentially a three person shop. Started back in 1978 by me, Paul Fisher, as Dragon Model Works.My first products were vacuum formed plastic aircarft kits to 1/72 scale. Over the next decade as I worked in the aircraft and industrial design field as a model maker the world of protoype / model making underwent a small revolution with the introduction of easily available fast setting silicone rubber mold making material, and more importantly, fast curing polyurethane resins. As I worked with these materials it became obvious that they could be applied to small scale manufacture of assembly kits that would allow much greater finesse and ease of assembly than the crude vacuum formed kits that had been the only real alternative to mass produced kits in injection molded plastic.This would make it possible to produce excellent kits of vehicles that were either not famous enough for the plastics companies to cover, or were desired by only a small niche market of serious model collectors. While doing a variety of model and pattern making for industrial clients, I began creating kits of historic racing cars and airplanes with an eye towards improving not only the accuracy of form, but the design of the model parts to make it easier for the end user to build. Back then we called this " human factors"...nowadays it's called user experience, or UX.The resin kit has come a long, long way. This design concept has grown over 40 years into a large catalog of kits that we sell all over the world. 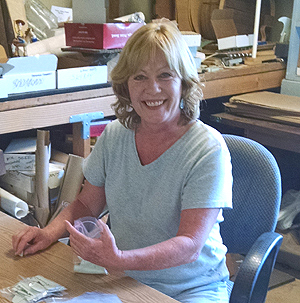 As my business grew my wife Susy came aboard to help, first with casting and mold making, eventually taking over all the packing and shipping. 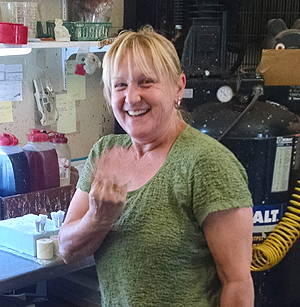 My sister in law Susan Simms then joined up to become production manager, making molds and casting the myriad parts that become our models. I remain at the bench, designing the models and crafting the master patterns that we use. I still do 99% of the pattern work by hand, old-school, as this remains the best way to capture the physical form of objects originally built by the human hand, but we have begun using additive manufacture and CAD to improve the fine details of mechanical assemblies far beyond that which can be done traditionally. I see this as the perfect blending of the manual arts and technology to allow model making to evolve,improve and flourish. So there you have it...a tiny family run shop manufacturing some of the best kits in the modelling world right here in Paradise, California. We love what we're doing, it shows in our work.